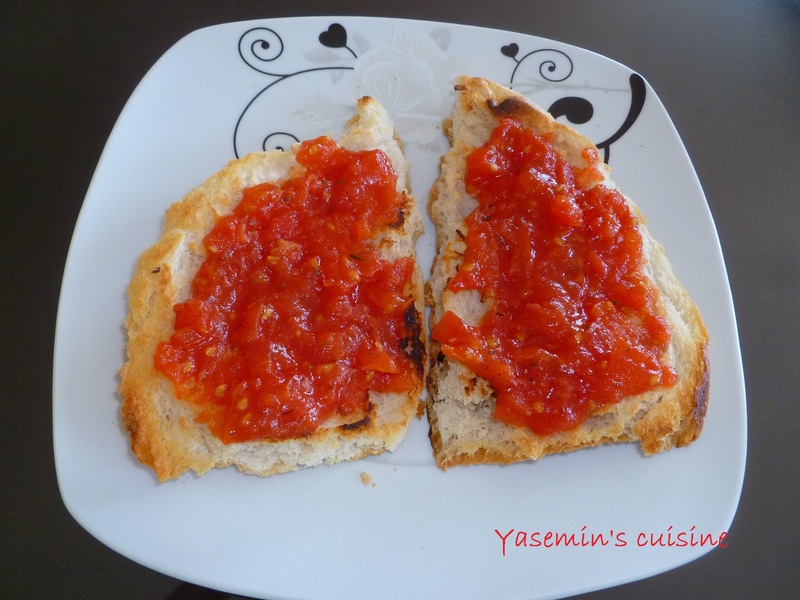 Pan con tomate, tostada con tomate or simply bread with tomato is a Spanish recipe (actually Catalan) . I discovered this last year while on Erasmus in Spain. To be honest I’m not a huge fan of the Spanish kitchen (don’t shoot me 🙂 ), but this is one of my favourite dishes (along with tortilla and paella), I can eat it every day! Actually, when I make pan con tomate it’s more my style. I call it pan a la Yazz 🙂 because I cook the mixture with, garlic, basil, pepper and oregano for 5-10 minutes. Perfect for breakfast. Try it! It’s so easy that you’ll love it. This entry was posted in Appetizers/mezes, Breakfast recipes and tagged breakfast recipe, Catalan, Spain. 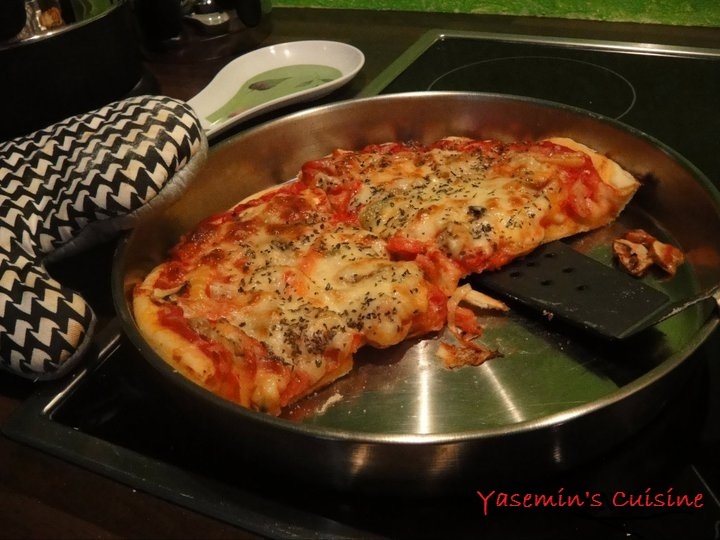 There is nothing like a good homemade pizza. It’s easy, cheap, healthy (ok maybe it’s not that healthy but it’s healthier than the ones you buy outside), but above all it’s delicious 🙂 Since the picture I took wasn’t really good, I used an old picture that a friend of mine took months ago. For the dough: 21gr of fresh yeast, 2, 5 cups of flour, 1 cup of lukewarm water, 2 teaspoons of salt, 1 teaspoon of sugar, oil. For the sauce: 1 clove of garlic (optional), olive oil, tomato paste or tomatoes , salt and black pepper. For the topping: Whatever you like! I used onions, bell peppers, mushrooms, mozzarella cheese, black olives and basil. Dissolve the yeast in a bowl with water. Add the flour, salt, sugar and oil to the mixture and knead for about 15 minutes until you get a smooth dough. Cover the dough with a towel and leave it to rise for 30 minutes. Divide the dough in 2 balls. Roll them out into pizza shapes and cover with tomato sauce. Sprinkle some cheese, put your preferred toppings on it and before you put it in the oven sprinkle more cheese on it. Bake in preheated oven at 200C for about 20 minutes. Don’t overload your pizza with toppings otherwise it won’t cook. 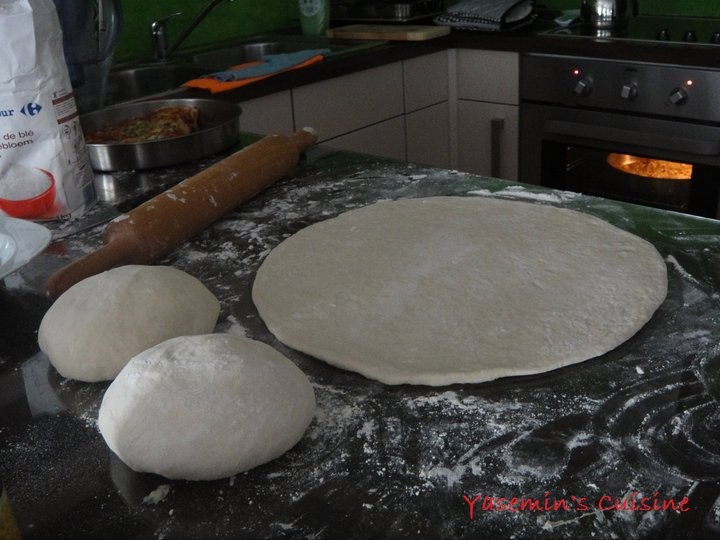 This entry was posted in Pasta & Pizza and tagged Homemade, Italian dishes, Pizza.